I thought the idea (at least my idea) behind Tokyo, Cancelled very clever. 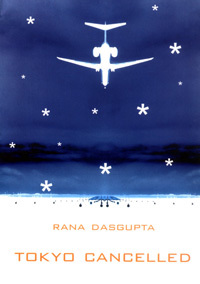 A modern take on Boccaccio’s Decameron where, instead of waiting out the Black Plague in a country villa, Rana Dasgupta’s storytellers’ are stranded in an airport by a snowstorm. Passengers unable to find hotels spend the night telling each other tales. Tokyo, Cancelled is a short story collection bound within a frame narrative. The stories have a fantastical edge to them and the book has the potential of being a wonderful blend of old and new. Unfortunately, the three stories I read didn’t fulfill that potential. The strongest, The Memory Editor, has a plot that is solid, uncluttered and interesting. The world is slowly succumbing to amnesia and preparations are being made for the time when everyone’s memories will have disappeared. A mysterious company has begun recording individual memories, editing out the unpleasant bits and plans (for a fee) to return them to their owners. The hero is a young man who leaves home and takes the job of editor. It is a beautiful, modern fable. The remaining two stories were strangely uneven in comparison. The Tailor is a lukewarm retelling of an old cliché: a poor tailor commissioned to make a magnificent set of robes for a prince. The plot is flat and the ending slapped on. Too little happens for too long and just finishing it became a struggle. In The Billionaire’s Sleep the author has taken what could have easily become 3 separate stories and smashed them into the space of one. And while I found it a little schizophrenic – this was the story that intrigued me most. A rich, infertile insomniac uses genetic cloning to create a child. He is surprised by twins, a beautiful girl & a monstrous boy. The boy is sent away. The girl is kept, but when she sleeps organic matter around her begins to grow at an amplified rate. Flowers sprout from her headboard. Her family house is destroyed by a tree which grows to the size of a skyscraper overnight. Meanwhile, the boy has a talent for storytelling and becomes a famous actor. The plot continues on from there, becoming more convoluted and disjointed before reaching its bizarre conclusion. You can’t help but feel that had Dasgupta focused the narrative this could have been a lovely story. Of course, these impressions are based on 100 pages of reading. So if you’ve read the book in its entirety and disagrees with me, I’d love to hear from you. Or if anyone would like to read Tokyo, Cancelled and share your thoughts I’d be happy to send you my (slightly used) copy. Please leave a comment below if interested. I don’t normally do book giveaways, but I very much wanted to love Tokyo, Cancelled. It just didn’t happen. I would love to read this book, if you still have it that is. Its seems so obscure.